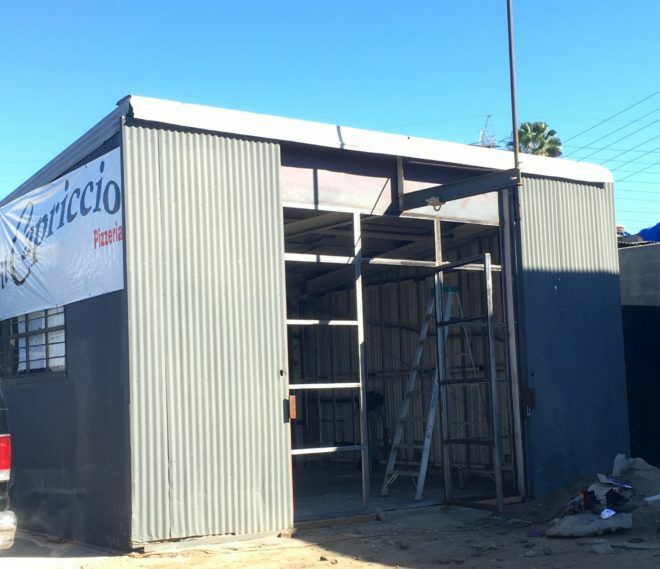 Elysian Valley — Il Capriccio – a classic Italian restaurant in Los Feliz – is opening a pizzeria in Frogtown’s rising restaurant scene. The restaurant went public with the news in September when it served up bowls of pasta in front of its new home during during the Frogtown Artwalk. Il Capriccio’s second location is nothing like the established and busy Vermont Avenue shopping and restaurant strip where it opened across from The Dresden in 2004. An Il Capriccio restaurant banner hangs from the side of a former machine shop in the 2900 block of Blake Avenue that is part of the Blox, a complex of new and existing buildings created by FSY Architects, which makes its home in a large white and glass box that rises above the neighborhood. The same complex is home to Wax Paper, a sandwich shop and one of several new restaurants, coffee shops and a brewery that have opened up in recent years. The Eastsider reached out to Il Capriccio but got no response. Il Capriccio is known for its classic dishes such as the Lasagna and signature ones like the black squid ink pasta and the Rigatoni alla Norcina (large tube pasta with their signature sauce and Italian sausage). No word on when the second location will open. The building looks like it’s still in the middle of an extensive renovation.